By LUDWIG VON KOOPA - I'm warning you. Turns out that instead of Masahiro Sakurai getting a day off, he now has another project to work on. While the constant use of negatives (“doesn't mean [it] hasn't been ...”? Why not “However, the next job is decided.”?) is a turn-off and an unnecessary obfuscation on Sakurai's part (that kinda thing is why he's not a reliable source but Famitsu is so we should be fine), what he's trying to say is that he can't just do nothing and relax. He has a new project now that he's done producing Super Smash Bros. 4 post-release content and any future balance patches will either not exist or can be done without him. What's the next job? Obviously not something related to Super Smash Bros., and it might not even be on a Nintendo system. We have no idea what it is and I won't try to speculate on it, just that some non-Sakurai power is willing it to existence. There is just one thing about it that I hope happens. Masahiro Sakurai is talking here about HAL Laboratory and the Kirby series, and I feel that he still feels this way today. While Iwata's passing is no doubt a tragedy, it does present an interesting opportunity for Sakurai's professional development. Satoru Iwata controlled Masahiro Sakurai's destiny all this time. Now, he can break free. Sakurai went from quitting HAL and making Meteos to being stuck making Super Smash Bros. games and Kid Icarus: Uprising all because Iwata basically made him. Read how happy Sakurai was working with Q Entertainment as a freelancer for Meteos! Masahiro Sakurai didn't want to work for a specific company after Meteos and hated the limitations and restrictions on what he could do. He wanted to work for all sorts of companies. The tragedy is that since Meteos, he has only been able to work with Nintendo. Sure, he got to use Game Arts and Namco as code-monkeys, but those came from being hired by Nintendo all those times. My message? LET SAKURAI WORK ON WHAT HE WANTS, or let him work with the various other people and companies that aren't Nintendo! Even if that means it won't be on a Nintendo system. Sakurai needs to follow his dreams. With Satoru Iwata no longer controlling his destiny, Sakurai should be able to have this freedom. If Masahiro Sakurai can do what he wants, I really think the gaming world will benefit immensely than having it be a sequel to yet another Nintendo franchise. And, dammit, let his injured arm recover. YOU MUST RECOVER! If Sakurai does happen to work with other companies that don't find themselves on a Nintendo console, Sakurai will be joining the line of developers Ludwig is fond of that are doing that, including Goichi Suda. That's fine. Ludwig didn't even play Meteos except for a brief stint at the demo stand. So what do you think about Sakurai's future? Should he be forced to slave away against his will for more Nintendo games, or focus on his dreams? Or do you think he should retire now? Ludwig wrote a sonnet for Sakurai way back in the day. It touches some of these themes. Ludwig has the greatest respect for Satoru Iwata and mourns his loss. Do not believe after reading this article that Ludwig is trashing him in any way. Apparently what Sakurai wants is to never give Jigglypuff a buff. Sakurai slaved away on the fifth Super Smash Bros. game too, and his work habits are even weirder and more unhealthy. I know what's coming up, FIRE EMBLEM BROS! At least if Sakurai wants to work on Fire Emblem and it's clear he is a bigger fan of it than he should be, it might end up on console again? What sorts of games do you think he might make? Sakurai said whatever the company hires him to do, whether it be FPSs or racing games. Let me rephrase my question. You recommended letting him work on what he wants. If he was making the games he personally wants to make, what types do you think they'd be? Clearly he has an idea in his head for a racing game (a real racing game not Kirby Air Ride), I guess. And he's not going to do another puzzle game if it were up to him. He's probably platformer'd out with all the Kirby games. Sakurai clearly has an affinity for action games (or at least games with clear freedom of expression and non-calm experiences), and I feel like if he made an RPG it'd be an action RPG. Interesting. A Sakurai-made action RPG might be a lot of fun, especially if it has a similar unlockable/collectible system like the ones in Smash Bros. and Kid Icarus. I liked that. Well he's already working on something, we just know nothing about it. Sakurai claims he WANTS to make those adaptions to other workplaces! And wants to work with characters 'sides Kirby! I wouldn't say he's running away... I'd say he wants to move on. ...Well I guess you could say that is running away, but you can't doom a guy to work on the same thing all his life. It might be the end of Smash Bros., but he always says it'll be the last one he works on and he always gets caught back in. 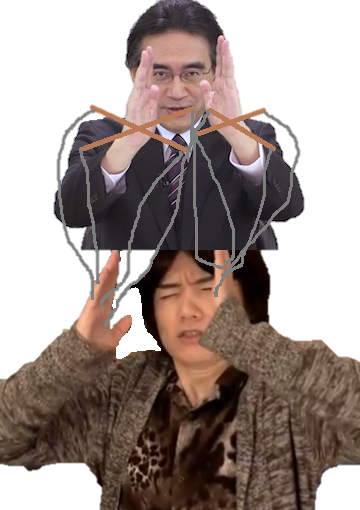 But without Iwata to do the puppet-mastery, he might be able to evade capture.